The fantasy of gardening on Maui: plants grow year round. We don’t have a true winter on Maui, meaning no freezing temperatures that cause plants to go dormant and animals to hibernate. Bugs are happy year round, munching your plants. Weeds are happy year-round invading your garden. Some plants, even pretty ones like bougainvillea, are so vigorous, they need to be trimmed constantly, all year-round. People, mostly non-gardeners, think that gardening on Maui should be an easy affair. Throw some seeds in the ground, and it will rain, there will be some sunshine, and then you’ll have a big harvest. If only we were so lucky. Thankfully, some plants and trees grow easily and vigorously with minimal care – passion fruit grows happily here, and so does chayote squash, at least where I live. Avocados are also pretty low maintenance, most of the time. The lush foliage encourages some people to think they can grow anything at anytime. But certain things actually fare better at certain times of the year. There is a summer and a winter at least for gardeners here. Summer is a better time to grow vegetables that produce fruits, botanically speaking, eggplants and tomatoes and cucumbers, zucchini, okra. Flowers and seed-producing plants like sunflowers are better in the summer. There’s a lot of sun and the weather is drier, conditions that they prefer. Sunflowers grow better in the summer. That's me dressed in my outrageous garden "combat" outfit. Winter time is better to grow root crops – beets, turnips, daikon radishes and plants that like cooler temperatures: celery, leafy greens. Squashes also tend to do during cooler temperatures, but before rainy season really starts. 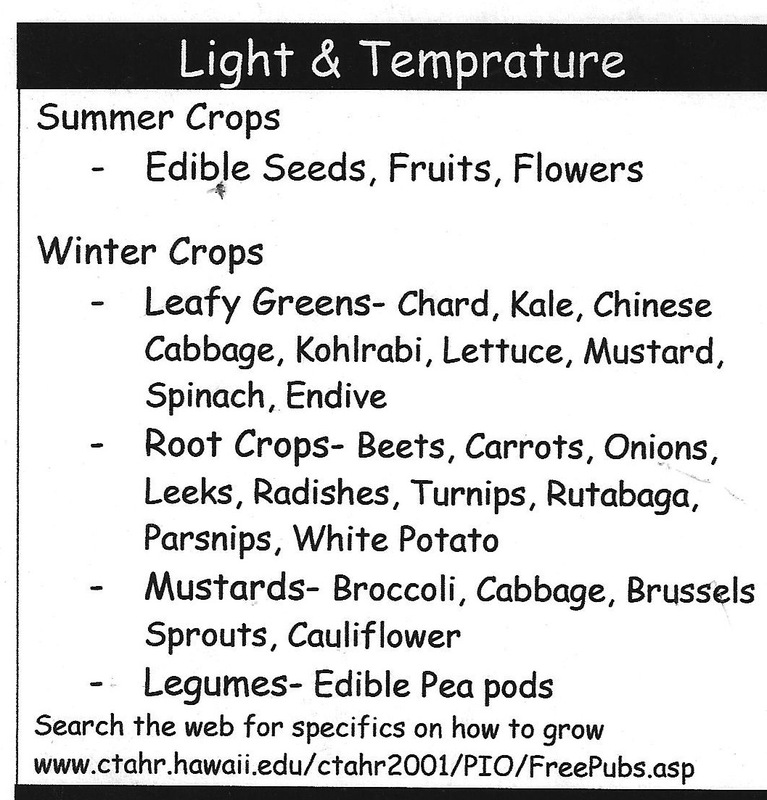 More info at the CTAHR (University of Hawaii's College of Tropical Agriculture and Human Resources) "Farmer's Bookshelf." 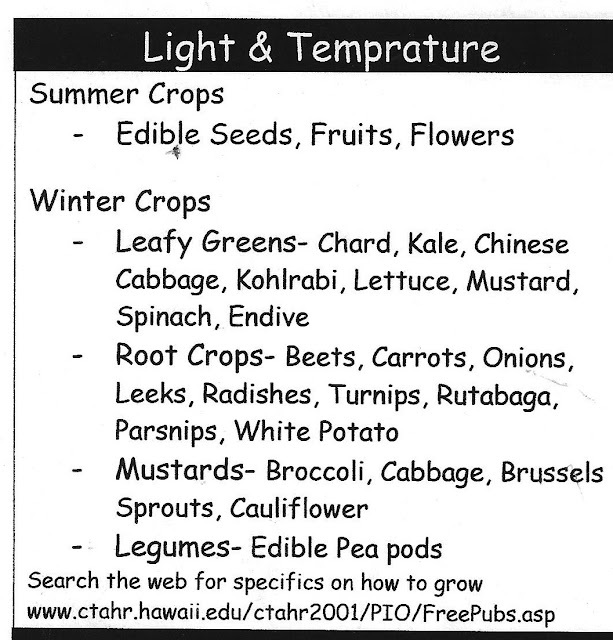 www.ctahr.hawaii.edu/ctahr2001/PIO/freepubs.asp, but it doesn't lead directly to a winter/summer gardening publication. These are general guidelines, not written in stone. Even though winter is still warm, often in the 70s and low 80s, the sun shines less intensely. When I lived on Kauai , the director of landscaping at one of the big southshore hotels said that certain things were better to plant in the summer. They just didn’t do well being planted during the winter, and she also said that plants grow more slowly in the winter. This was important because if the hotel needed to fill a gap in planting, the staff needed to take into account how quickly that gap could be filled. Another gardener who has been teaching gardening classes at the Haliimaile Community Garden also confirms this idea and says that land yields about half as much output in the winter as in the summer. So, yes, if you really insist on growing tomatoes and watermelon in the cooler winter months, go for it! Let us all know how it turns out.